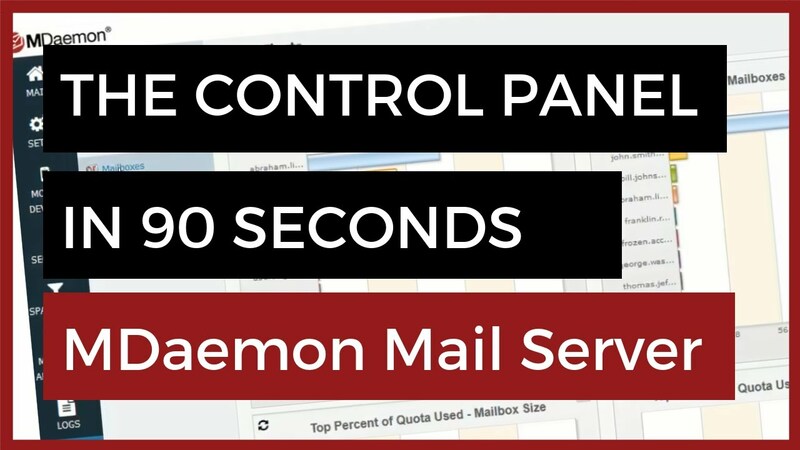 Control over your company email, without it becoming a distraction. Absolute control when you need it, zero hassle when you need to be focusing on your business. Beautifully easy to use, and available from anywhere you have access to a web browser, MDaemon's control panel makes it quick and simple to control every aspect of your MDaemon server. The only protection you'll need against spam, viruses and unauthorised access. Cybercrime is widely regarded as one of the biggest global threats, and ransomware attacks alone are estimated to cost businesses a whopping £4.5 trillion annually by 2021*. Your mailboxes have never been under greater threat, however MDaemon boasts a powerful mix of open standards-based and proprietary email security technology that will keep the unwanted attention (and email) away from your server. Detection technologies including CYREN Outbreak Protection keep your mailboxes clean, detecting emerging and evolving threats fast. Trusted by both Google and Microsoft, CYREN antivirus is MDaemon’s primary scanning engine. Supplementary inline scanning is provided by Cisco’s open source ClamAV. Protecting your server and domain from unauthorised use by cybercriminals. MDaemon includes a wealth of protection tools, including hijack detection, dynamic screening and more. Secure your communications from eavesdroppers using SSL. Choose a commercial certificate or use MDaemon's Let's Encrypt integration. Manage your tablets and phones. MDaemon's Mobile Device Management (MDM) console is your 'go-to' place for configuration and management of your phones and tablets. In addition to full synchronisation, the MDM enables you to implement a range of IT policies appropriate for both company supplied devices and those that are individually owned. Use autodiscovery to add new phones and tablets in using only an email address and password. Enforce secure passwords, define attachment download rules and manage camera/browser settings. Full or partial wiping of mobile devices in the event they become stolen or lost. A perfect picture of your server activity, at-a-glance. Track the journey of messages, highlight potential issues and perform simple troubleshooting from a single control panel. MDaemon's graphic reports and real-time session logs ensure you're kept in the picture about exactly what your server is doing. MDaemon is based on a flat file-based architecture, which eliminates the possibility of a database corruption and makes it straightforward to perform a live backup, by copying the main installation folder as part of your normal routine. Make a copy of the MDaemon folder with any reputable backup software. Replicate it to another location to benefit from a complete snapshot of your installation suitable for disaster recovery. Avoid significant downtime and many hours of costly database repairs with MDaemon's simple design based on a flat file architecture. Split users across multiple MDaemon servers and have them able to distribute mail according to where those specific users reside. Customise server behaviour based on the content of messages. Route copies to other users, trigger an instant message, run programs, and more. Use the built-in archiving to safeguard a copy of your messages or MailStore Server for a compliant mailbox management solution.